Welcome to the Beverly Hills office of Drs. Alan Zweig & Aaron Schwartzman. Our practice specializes in prosthodontics - this includes all aspects of cosmetic, esthetic and implant dentistry, as well as full mouth rehabilitation. This speciality involves the restoration of natural teeth and/or the replacement of missing teeth and oral and maxillofacial structures with artificial substitutes. We utilize the latest technology in all of our treatments and pride ourselves on our attentive, caring approach to dentistry. Your visits with us are all about you – your happiness, your comfort and your overall satisfaction. Our philosophy is to advise patients with a view to long-term dental health. Among our most important functions is to educate our patients as to their treatment options. With over 35 years experience, Drs. 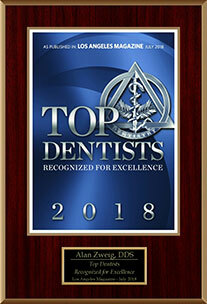 Alan Zweig & Aaron Schwartzman and their friendly, professional staff strive to make each dental visit as enjoyable as possible and take pride in tailoring treatment to the individual patient's needs and preferences. We invite you to contact our office to learn more about achieving the smile of your dreams. Choosing a new dentist is a big step, so please, don’t be afraid to call us or email us with questions about what we do and how we do it. If you’d like to meet us and see if we are the right office for you, simply press the button below for a printable coupon entitling you to an office consultation at no charge. Thanks, and we hope to meet you face to face, soon. Please click on the following button to fill out your patient forms prior to your appointment. Drs. 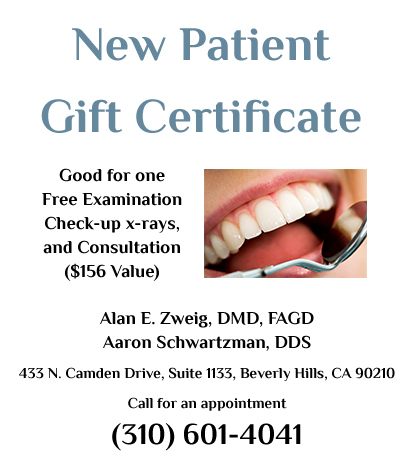 Alan Zweig & Aaron Schwartzman have been creating beautiful smiles for over 35 years! Take a look at our successful cases by clicking the links below. 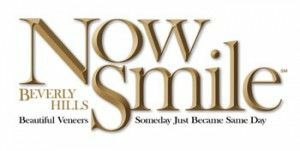 Now Smile makes it possible for you to have a new beautiful smile by the end of the day. Beautiful porcelain veneers, dental crowns and laser gum recontouring to give you the smile and look you always wanted — in just hours! "Dr. Schwartzman and his staff are excellent! Everyone is friendly and very professional and they make sure the patient understands every procedure on his/her treatment. I highly recommend them to everyone!" "Its always a pleasure coming to your office. Everyone is so courteous helpful and professional." "It was as pleasant an experience as one could possibly hope for in a dental office!" "Pam is an excellent Dental Hygienist! She is a top-notch professional and truly cares about your dental health and preventative care." "Visiting Dr. Schwartzman is always a pleasure, which is saying a lot when it comes to going to the dentist. He has a gentle hand and a charming manner. The office is clean and the staff professional and on time. Parking is easy (an hour free across the street) and most of the exam rooms have wonderful views of Beverly Hills/Century City. I would highly recommend Dr. Schwartzman and plan on seeing him for years to come." "One of the better experiences I've had at the dentist! The minute I walked in a very friendly receptionist was ready with my paper work and in about 10 minutes I was getting my teeth cleaned. I got some speedy x-rays and sat down with Aaron Schwartzman who was very helpful and caring. A+"
"Seen on time; Very professional; Excellent work... The BEST"
"Very professional and friendly. My appointment was at 10:00 a.m. and they call me at 10:05 a.m. is great that they honor your time. But the result of my treatment was the most successful experience I have ever had." "I always know I'm in good care with Dr Zweig and his team. I've been coming here for over 30 years!" "I called in the am, and got an appointment the same day. Dr. Zweig quickly determined my problem (a lost filling), re-assured me it was "no big problem", and fixed it in under 30 minutes. Could not have gone better!" Our goal is to help maximize the life of your natural teeth and help you achieve or maintain the positive attitude and confidence that one acquires with a beautiful smile.